This was an apparent reference to the cases involving Vijay Mallya, Nirav Modi, and Mehul Choksi. New Delhi: Prime Minister Narendra Modi on Tuesday expressed confidence that defaulters will not be spared and will bring them back to India. Talking to news agency ANI, PM Modi said, “Those who fled during this government, they will be brought back, today or tomorrow. Diplomatic channels, legal courses, and seizure of properties being done. Those who have stolen India’s money, they will have to compensate for each and every penny. This was an apparent reference to the cases involving Vijay Mallya, Nirav Modi, and Mehul Choksi. Last year, in a major achievement, the ruling government was successful in bringing back Christian Michel, the alleged middleman in the AgustaWestland helicopter deal. Michel, a British national is accused of paying kickbacks to secure the Rs 3600 crore deal for 12 VVIP helicopters in 2007. The deal was scrapped in 2013 following the bribery allegations. Michel is one of the three middlemen being probed in the case, besides Guido Haschke and Carlo Gerosa, by the ED and the CBI. Both the agencies have notified an Interpol red corner notice (RCN) against him after the court issued a non-bailable warrant against him. However, he had denied the charges. Former IAF Chief SP Tyagi (73) was also charge-sheeted by the CBI in a Delhi Court along with nine others in connection with a bribery case in the VVIP chopper deal. He is the first chief of the Indian Air Force to be charge-sheeted in corruption or a criminal case by the CBI and he has denied all charges against him. Last year, in the second major achievement for the Narendra Modi government, the Westminster Magistrate Court in London on Monday ordered the extradition of beleaguered businessman Vijay Mallya to India to stand trial on the charges brought by the CBI and ED. Chief Magistrate Judge Emma Arbuthnot had referred the decision to the UK Home Office for the Home Secretary, Sajid Javid, to pass an order based on the verdict. 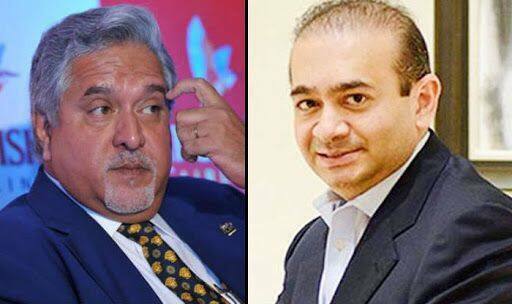 Mallya (62) is wanted in India on alleged fraud and money laundering charges amounting to an estimated Rs 9,000 crores. He has been on bail since his arrest on an extradition warrant in April last year. Modi and Choksi, and their three partnership firms, Diamond ‘R’ US, Solar Exports and Stellar DIamonds, are accused of routing Rs 13,500 crore worth of fraudulent transactions through state-owned PNB. Both left India in the first week of January 2018, weeks before the scam broke.